My First VMworld Show!! WOW. So, my biggest regret was not sitting in any of the labs. I’m just kicking myself. Truthfully that is the biggest lesson learned of the event. I did get a chance to sit through about 4 sessions before I finally threw in the towel. It seemed that every day you had to show up about 15min’s earlier then you did the day before to any given session. 45min wait to get into some was a little crazy but in most cases it was worth it. My hope is next year in Vegas will be better. Now, I’m not a big Vegas fan. One of the cool things about being in San Fran was the ability to go from event to event and Vegas can get crazy with locations. We’ll see how that goes!! Vegas is good for about 2 days before it becomes a HUGE beating. So if you spent any time at VMworld, what was drilled into your head were Cloud Based Solutions and Virtual Desktops (VDI). I spent the majority of my time in the VDI sessions. VMware View 4.5 looks SOLID. I’m most excited about their offline feature, as well as their tiered storage feature. The Offline mode is the straw that I think finally breaks the camel’s back in regards to VDI adoption rates. In my opinion, one of the largest hurdles (other than Storage cost) was connectivity to the network in order for VDI to work. Now, with a lot of companies that have field offices or even field employees this gives them a tremendous capability to unleash VDI as a desktop solution. One of the sessions I sat through that was the most appealing was the VDI Performance session, Specifically around “How to benchmark VDI”. 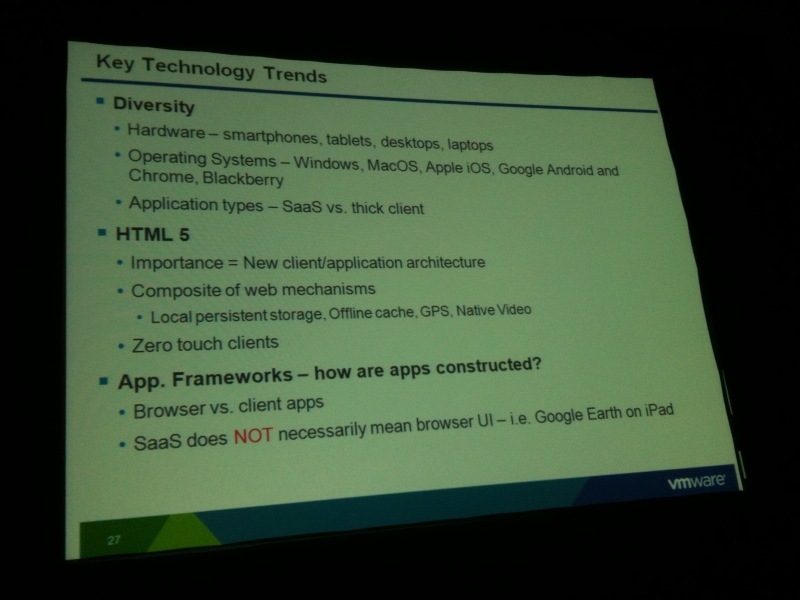 VMware View Planner was positioned as the next generation of VDI workload generator. It’s essentially an appliance package that is designed to work with View 4.X and it allows you to setup Workload profiles, enter in the types of applications that type of user would utilize and then run against your system. It would then run and give you a “pass/fail” on the overall solution based on a QoS you define. Please note, I’m really summarizing its features and abilities but the net-net is that VMware View Planner should be a great tool to use when trying to get a better understanding of what your infrastructure can support. I also like the idea of “What if I add another host, what happens” type scenarios you can play around with. Lots of cool stuff!! Finally, another session I sat through discussed the market trends in driving desktop virtualization. It seems that Apple is driving some of the need. I don’t know about your company, but at Xiotech I’m seeing more and more people utilizing MacBook’s and iPads for business use. Virtual Desktop is the perfect fit for these types of situations. The ability to serve up Microsoft specific applications, on a non-Microsoft product (Apple, Linux etc) is a great value-add. It also really speaks to the “Bring your own PC” discussion that typically comes up in VDI discussion. So heed my advice, go to VMworld the next chance you get, remember Vegas is going to be a beating !! It is so worth the time and effort. VMware did a spectacular job in pulling everything together. This is definitely on my list of “Must attend” events!